While there is no official animal of Halloween, we would like to cast our vote for the vampire bat, although, the black cat did run a formidable campaign! Bats are a staple of any Halloween decoration box, but they are normally all black and nonthreatening silhouettes of the real thing. This Wing Flying Bat decoration, however, is the real deal. 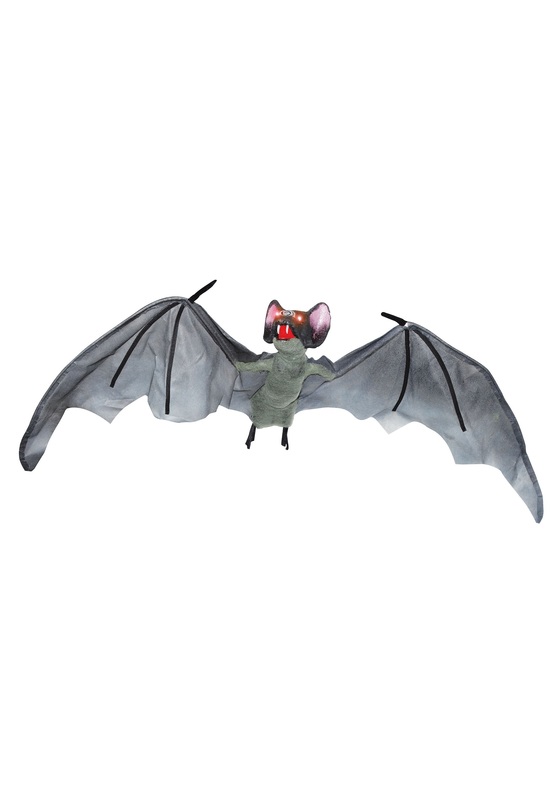 It tosses what we thought we knew about Halloween bats out the window! After we saw this decoration we jumped on – insert preferred search engine here – to find out a little bit more about bats, only to discover that bat colonies can reach numbers in the millions, yikes! This Wing Flying Bat decoration has eyes that glow blood red, piercing anything its gaze falls upon. With light grey fur, white fangs, and whopping wingspan of 50 inches, this bat is sure to impress. His most compelling feature, however, is how his giant wings really move and it makes bat noises! Keep this decoration in a corner for a subtle spook, but for the ultimate of spooks, we have an idea… First, you need to hang this bat right above the light switch in a dark room – we recommend coatroom or bathroom for guaranteed results. Second, you host a Halloween party, of course. Third, have an unsuspecting guest go looking for the light switch. Fourth, make a bag of popcorn and wait for the show. Fifth, laugh your pants off as your guest goes batty!